Border Policy Conceptual Collage, Image courtesy of Jonathon Keats. In the spring semester of 2017, Hampshire College announced the arrival of the world’s first non-human scholars-in-residence: plasmodial slime molds known as Physarum polycephalum, traveling all the way from Carolina Biological Supply to take up an office in the College’s science center. 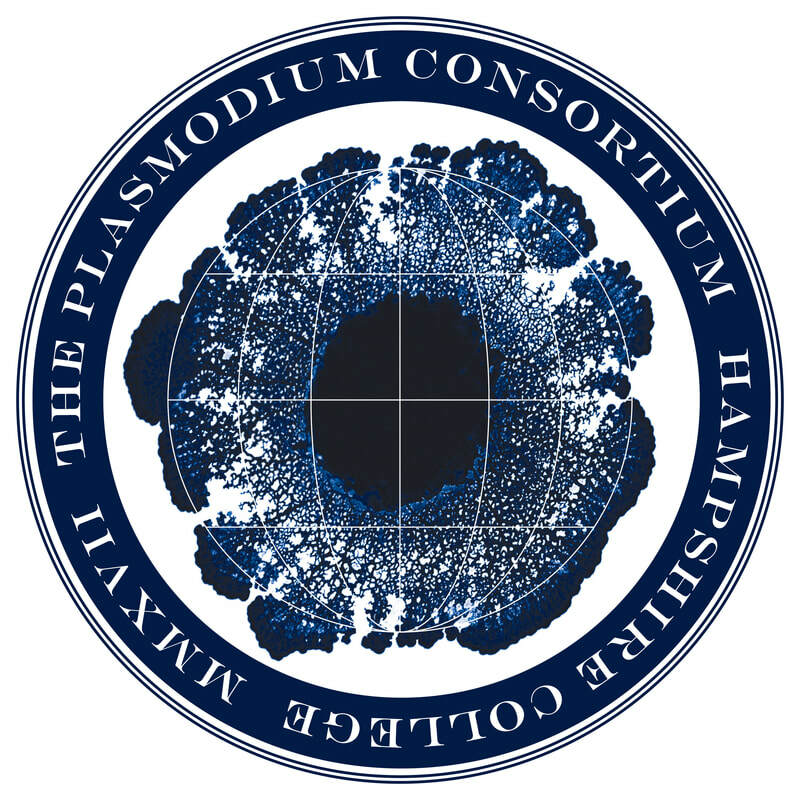 Plasmodium Consortium seal, designed by Jonathon Keats with source image courtesy of Audrey Dussatour. The brainchild of experimental philosopher and conceptual artist Jonathon Keats, biologist and assistant professor Megan Dobro, and myself, The Plasmodium Consortium was established as an interdisciplinary think tank aimed at enlisting the optimization skills of slime mold to address global problems ranging from food insecurity to income inequality. We were particularly drawn to their collective problem-solving behavior. When challenging conditions confront the single-celled organism, individual cells fuse their membranes to form a super-organism. Singular and plural are permeable states; the syntax of self and other breaks down, and self- and collective interest become one. 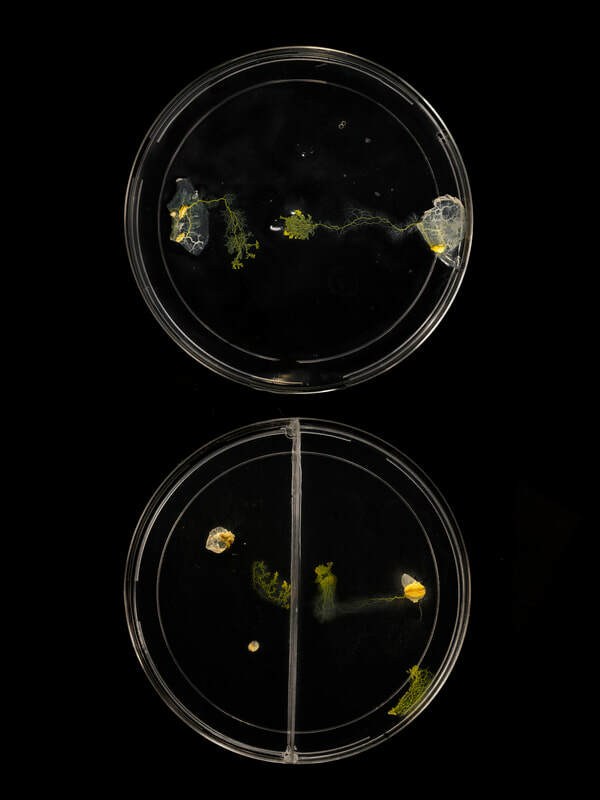 Slime molds work by sensing and responding to their environment, sending out “protoplasmic tubes” to create links among resources, and sending chemicals back and forth across this decentralized network to make decisions about collective movement. The most efficient routes are reinforced, forging the desire lines of a primordial bio-intelligence that prompts us to reconsider our sense of supremacy in the hierarchy of knowledge. 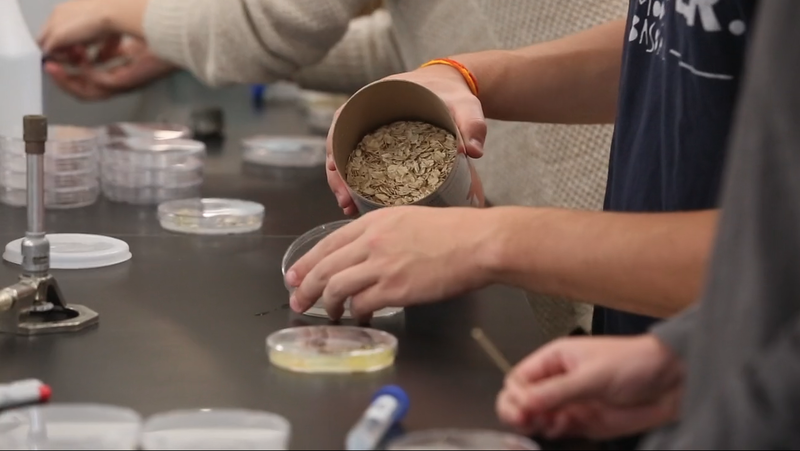 In addition to an office (and office hours), the slime mold have a faculty page, and a collaborative role in the kinds of experimental, interdisciplinary coursework for which the College is known. As the Consortium steering committee we wondered whether - and hoped that - the slime mold’s presence would help develop new relational patterns on campus, new policy recommendations for institutions both local and global, and maybe even new ways of being in the world: being more permeable to possibility. Students setting up experiments. Image courtesy of Andrew Hart, Hampshire College Communications. 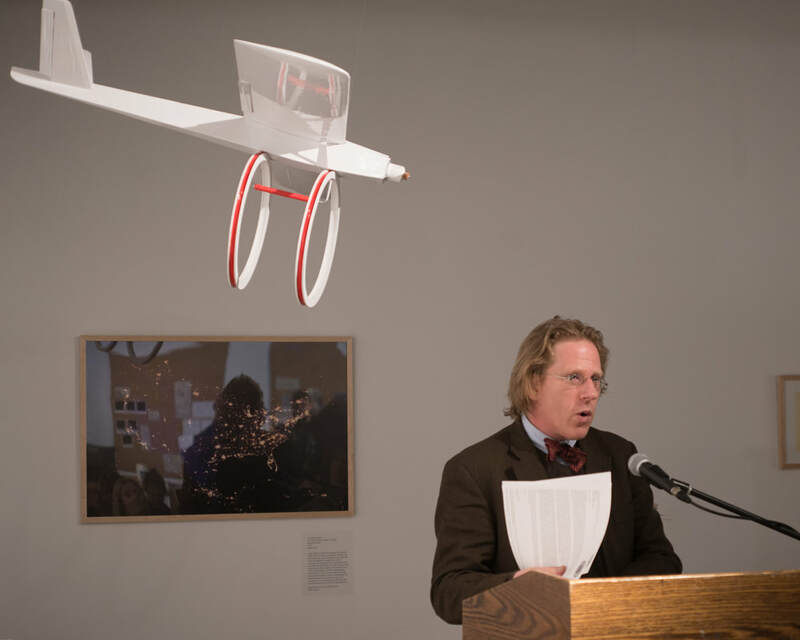 In the fall of 2017 students, staff, and faculty met and mingled with our visiting scholars Physarum polycephalum and experimental philosopher Jonathon Keats in a series of collaborative workshops to consider the pressing questions of the day from diverse disciplinary perspectives - architecture and anthropology, poetry and computer science. It marked an attempt to break from the siloed, hierarchical and linear structures of traditional knowledge-making. Food access investigation. Photo credit Ray Mendel. ​From these initial encounters emerged several resounding questions: What is the nature of intelligence? Why do we place humanity at its apex, despite all the evidence of our biases, our foregone conclusions? 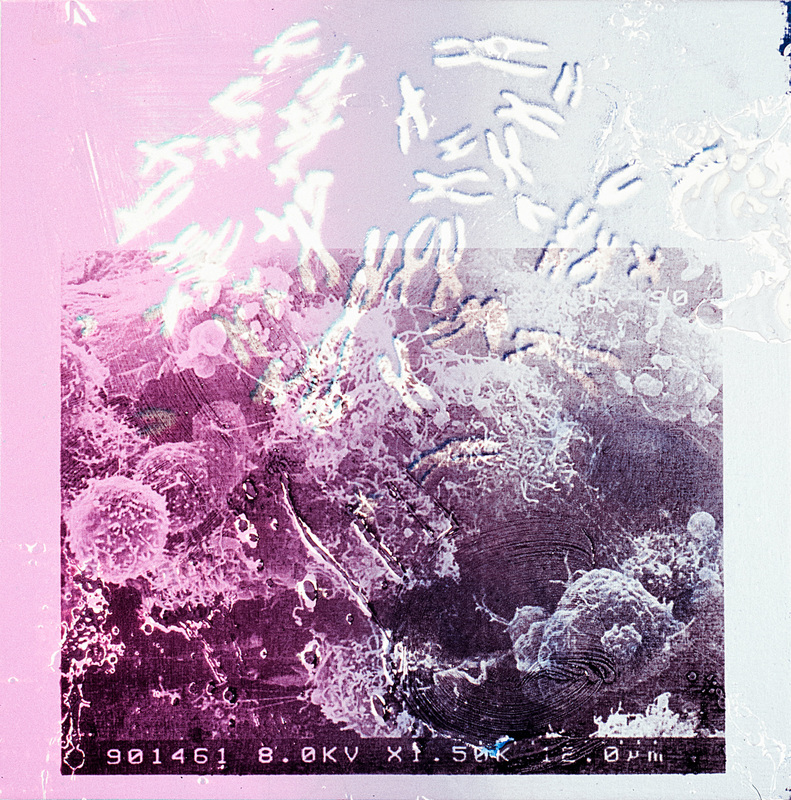 How might we think with slime mold, from within their frame of reference (if never fully knowable), to consider seemingly intractable global problems? Perhaps slime mold might offer new perspectives, informing policy recommendations to institutions and organizations both local and global. 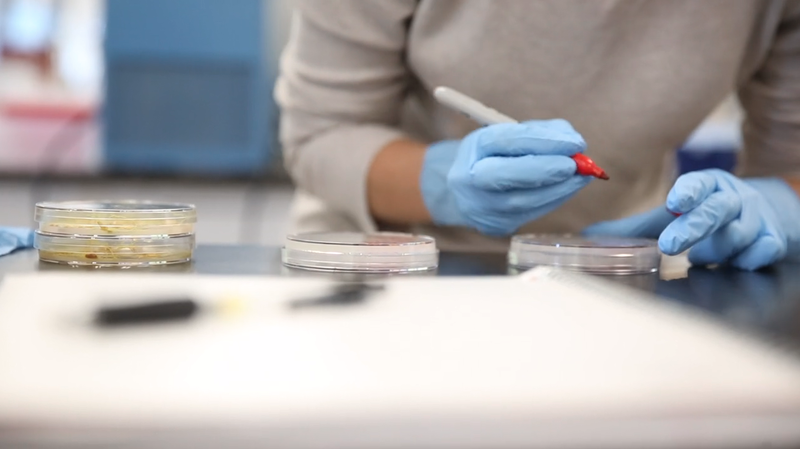 ​Process was paramount in the student investigations that followed from these workshops, embedded in the curriculum for a course on Microscopy and Modeling taught by Megan Dobro. Rather than the neat, linear path traversed in a scientific journal, the projects they pursued presented promissory notes for further elaboration. As with any model, each investigation necessarily involved assumptions and abstractions in the absence of complete information. Some used real-world data while others modeled dilemmas in the abstract as a basis for developing alternative heuristics. All offered annotations and early research, initial experiments and preliminary results; they act as field notes to missteps and marveling, to both rigor and randomness, to a meeting of minds, human and non-. Looking into the Hampshire College Art Gallery from the library stairs. Courtesy of Amy Halliday. 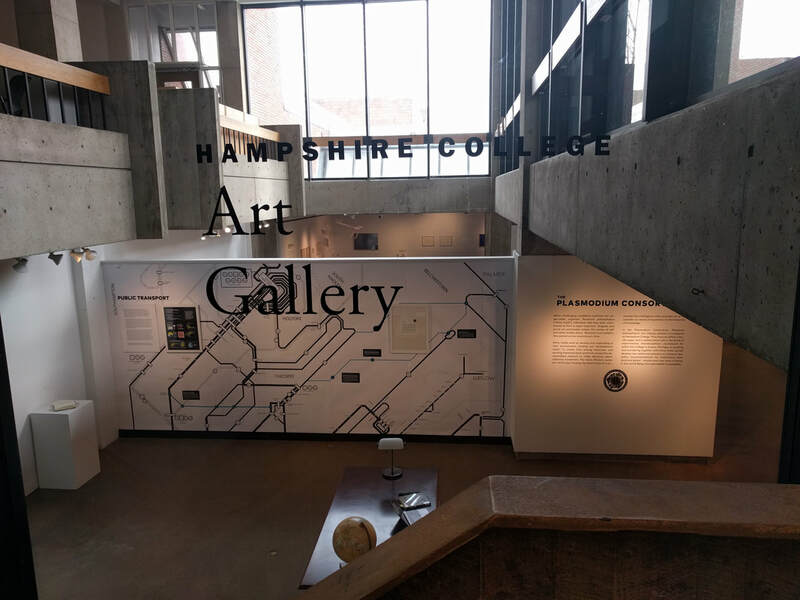 This spring 2018, the Hampshire College Art Gallery transformed into the communications headquarters and public dissemination forum for the Plasmodium Consortium. 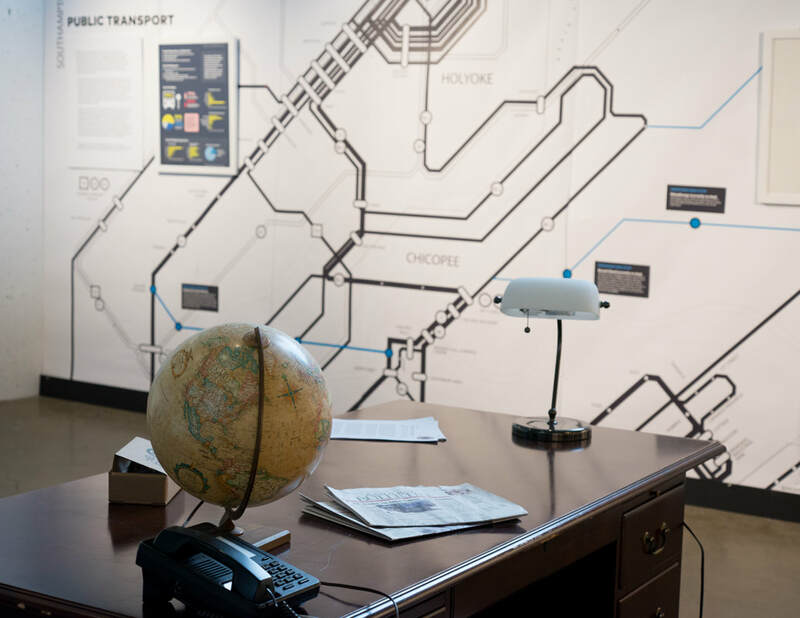 A communications desk greeted visitors, along with a policy circular, recent press releases, and other institutional ephemera, many of them sporting infographics, letterheads, and typography designed by associate professor of architecture and design Thom Long, who, after taking part in the fall workshops, found himself drawn into a practical engagement with how art and design can help to communicate scientific information. The Plasmodium Consortium communications desk. Image courtesy of Amy Halliday. 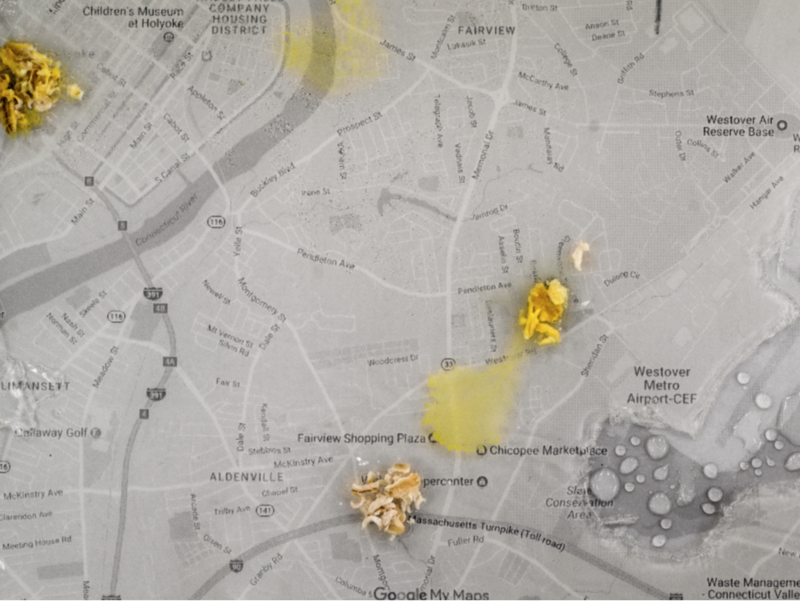 ​Surrounding the desk were five representative investigations undertaken by slime mold and students: they explored food deserts, public transport, drug addiction, border policy, and the relationship between affluence and environmental toxicity. Setting up a context of the contemporary opioid crisis, for example, students explored whether slime mold - known to select valerian root (which depresses its natural foraging behavior) over nutrition in a binary choice - could be weaned off valerian root addiction towards pure nutrient across a gradient of less concentrated drugs. They also examined whether it can, in turn, be “lured” into more concentrated drugs in the other direction: the asymmetry of growth (greater outwards towards nutrition than inwards towards pure valerian) preliminarily supports a call for legalizing marijuana, helping to break the stalemate in policy circles around so-called “gateway” drugs. For each investigation, Consortium secretary Jonathon Keats dispatched a policy recommendation by mail to the relevant government official: a conceptual leap, perhaps, but also a deeply serious questioning of the partisan political status quo. Addiction experiment. Photo credit Ray Mendel. 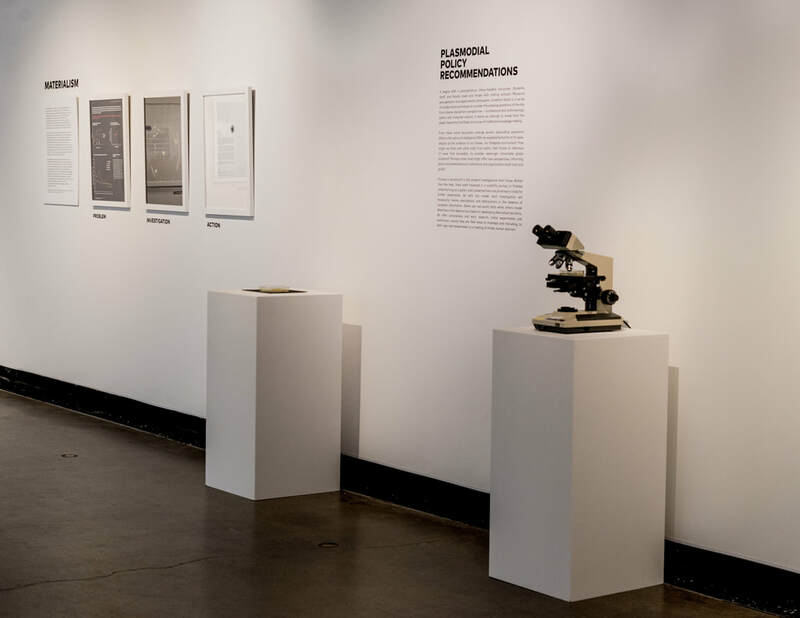 Plasmodial Policy Recommendations, installation view from ​The Plasmodium Consortium​. Hampshire College Art Gallery, 2018. Photograph by Ray Mendel. The Plasmodium Consortium process board on addiction and border control, featuring student notebooks and annotations, photographic documentation, relevant news articles. Image courtesy of Andrew Hart, Hampshire College Communications. ​A lab was also set up in the gallery. 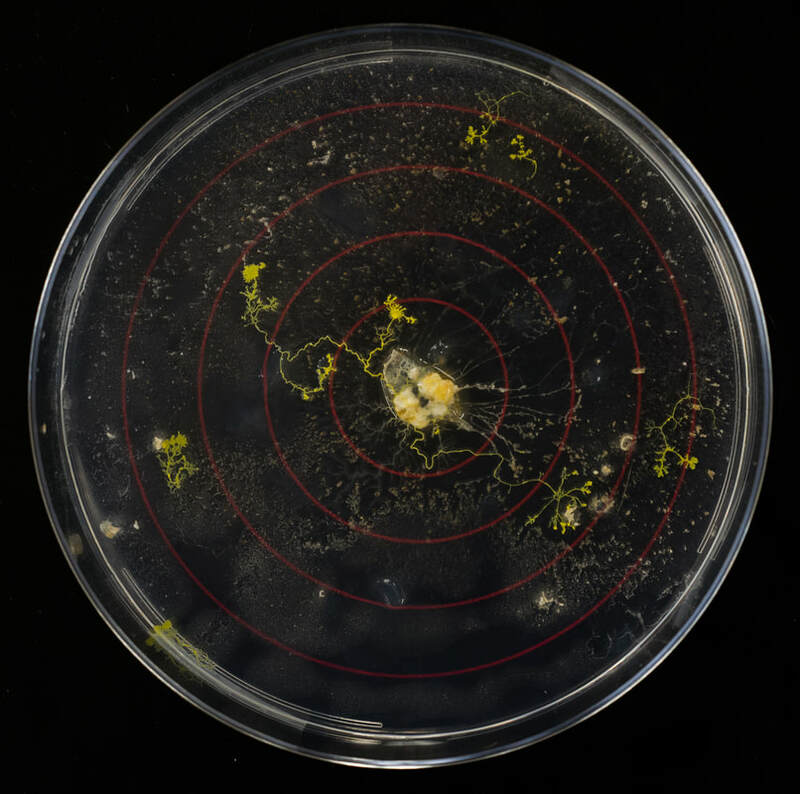 There, human and non-human scholars played out a complex choreography while senior students intermittently continued their investigations alongside slime mold. 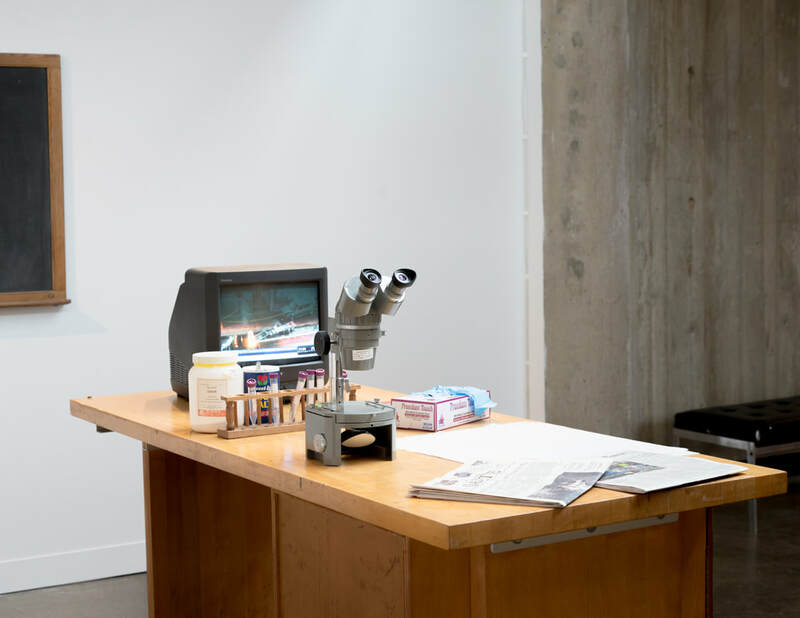 As science was performed within the public space of the gallery, hypotheses were challenged and experimental design refined. 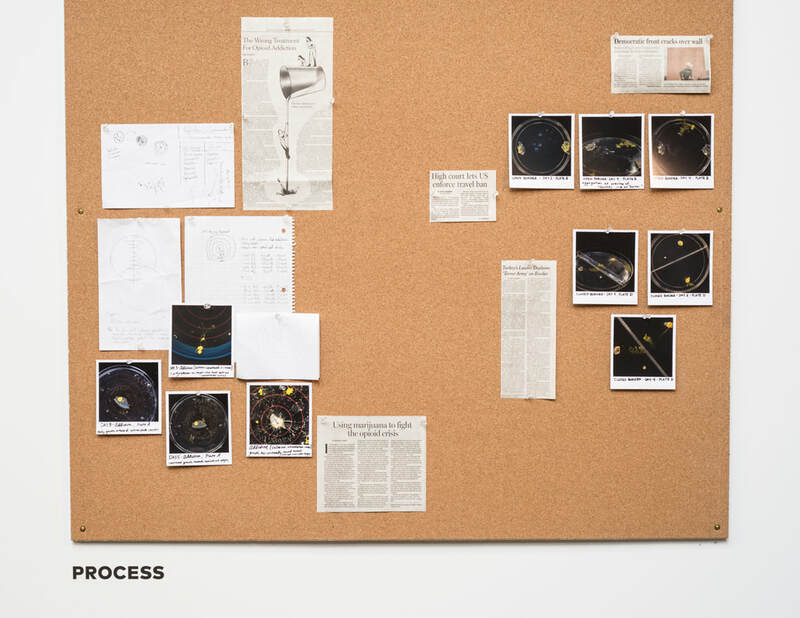 Unexpected results and newly pressing questions - influenced by daily news, informal discussion, or a puzzling discovery - informed iterative changes within the space. The exhibition, much like the scientific process, became a dynamic, unpredictable - perhaps even living - thing. The Plasmodium Consortium gallery lab. Image courtesy of Andrew Hart, Hampshire College Communications. Open and closed borders comparison experiment. Photo credit Ray Mendel. 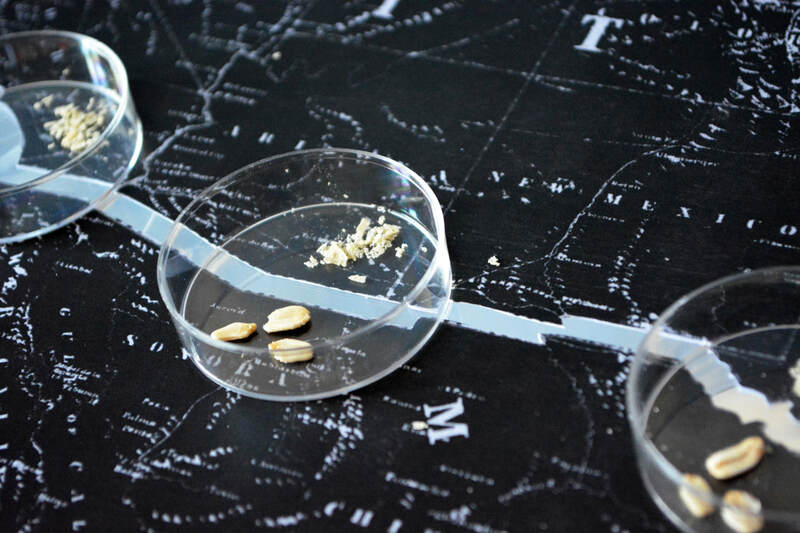 ​Visitors were encouraged to expand the reach of The Plasmodium Consortium by conducting their own investigations with “mobile research units,” considering how they might model questions that they find relevant or pressing within slime mold’s frame of reference. Kits contained the basic constituents and instructions for an investigation: mobile researchers (dried slime mold poised for reactivation), an environment (Petri dish), growth medium (agar), incentives (oat flakes), and barriers (salt). A selection of results from these, and our on campus experiments, were circulated to the United Nations, the United States Congress, and governing bodies worldwide. As results were disseminated throughout the project, our slime mold scholars courted local and national attention, alternately finding themselves the subject of a speculative New England Public Radio feature presented at the Live Arts Magazine in Northampton, MA, and proposed as a science advisor for Trump by Vox. 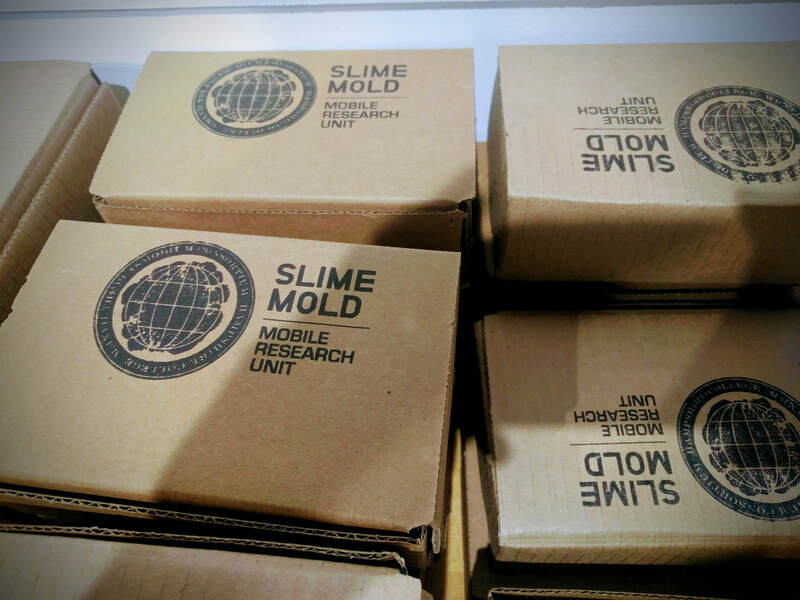 Slime Mold Mobile Research Units, available as consultants to be dispatched as part of The Plasmodium Consortium. Hampshire College Art Gallery, 2018. Photograph by Ray Mendel. 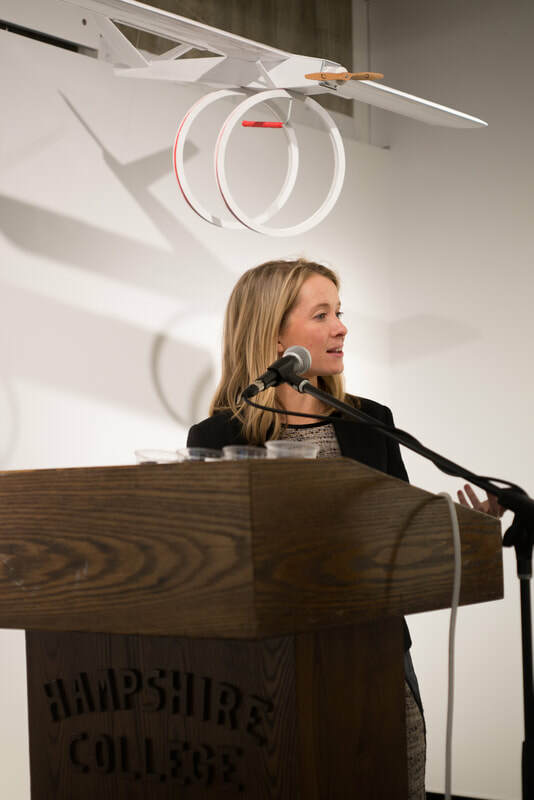 On March 2nd, 2018, students, staff, faculty, guest artists, journalists, and members of the campus and broader community gathered to discuss The State of the Plasmodium. Project participant students talked about how their engagements with our plasmodial scholars ranged from Petri dish experiments to the metaphysics of a slime mold cosmology informing a science fiction story. A range of professors who were involved reflected on how it challenged their own disciplinary thinking and research - about models and modeling, about intelligence and thought - and how they planned to integrate slime mold into courses ranging from applied ethics (what happens when you refer to a non-human subject as a “collaborator”?) to creative writing and unconventional computing. 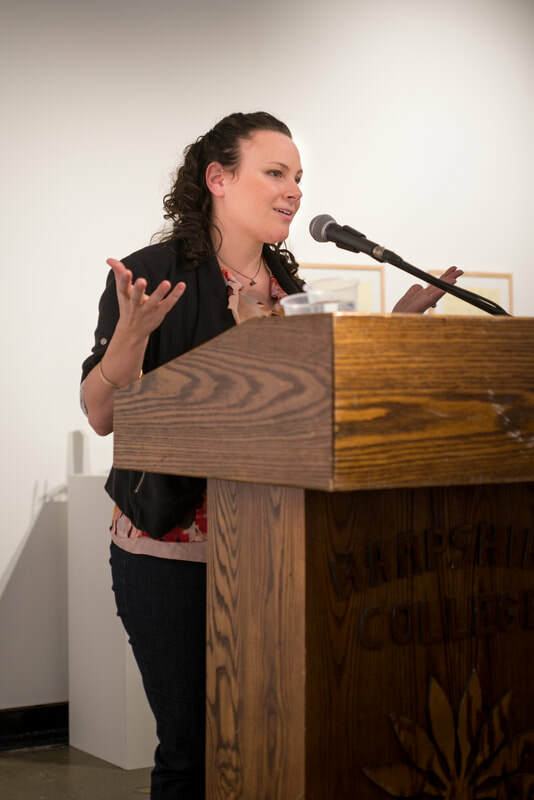 Amy Halliday, gallery director. Photo credit Ray Mendel. Megan Dobro. Photo credit Ray Mendel. Jonathon Keats. Photo credit Ray Mendel. ​After a stirring talk on the state of art-science collaborations by artist, SciArt founder, and - perhaps not surprisingly - Hampshire College alum, Julia Buntaine, Consortium secretary Jonathon Keats took up Spector’s call for “beautiful audacity” by announcing that our slime mold scholars have officially been nominated for the Nobel Peace Prize. It turns out that professors of social science, and leaders of peace research institutes (as the Consortium considers itself in its attempts to address seemingly intractable human issues outside of human prejudice and partisanship) are eligible to make nominations. We’ll find out the results in October 2018 – so stayed tuned. Or - if our plasmodial colleagues do not win - we’ll see them amongst the listed nominees in 50 years, when disclosure of information restrictions lapse. Perhaps, by the time another half century rolls around, we’ll have reconsidered the hubris that places our self-interested individualism at the apex of knowledge production. Perhaps, by then, taking seriously the policy advice of a highly-evolved environmental intelligence won’t be the stuff of art-science audacity. Drug addiction: Matt Hinderhofer (F17, Div I), Rick Noble (F17, Div II), and Hannah Davidson (F16, Div II), with initial workshopping alongside Daniel Altschuler (Linguistics) and Pamela Stone (Anthropology). Border control: Rick Noble (F17, Div II). Food deserts: Abigail Moore (F16, Div II) with initial workshopping alongside Thom Long (Architecture and Design), Ben Solis (community member), and Lee Spector (Computer Science).